By Felicia FonsecaA new exhibit at the Heard Museum in Phoenix draws on the popularity of the Geronimo name but also highlights the not-so-recognizable stories of Apaches who did and did not share his Chiricahua heritage. The exhibit "Beyond Geronimo: The Apache Experience," runs through January. By Raquel VelascoJanet Cantley, curator of the show, gives some insight into the story that’s become a keystone of Apache history. Q: What’s the back story on “Beyond Geronimo”? A: We want to illuminate a dramatic and often misunderstood chapter in American history and culture. I think a lot of people don’t understand the true history of the Apache people, especially Geronimo. We want to tell the story that has not been told, in terms of trying to dispel some of the myths of the Geronimo image by focusing on who he was as an individual. Q: Why is it important to know the truth about Geronimo’s legacy and the Apache people? A: Geronimo and the Apache people are part of Arizona’s history. It is one of the stories of the native people of Arizona. It is the story of how there are six distinct Apache tribes. I think it’s really important that people do understand a little about the experience of Geronimo and his life. How he acted in the final surrender in 1886. He and all of the Chiricahua were taken as prisoners to Florida and Alabama and Fort Sill (Okla.). The children, ages 12 to 25, were taken in groups to boarding schools, so they were further removed from their families. The Chiricahua were never allowed back to the state officially.Comment: For more on Geronimo, see Code Name: Geronimo the Movie and Did Prescott Bush Steal Wrong Skull? 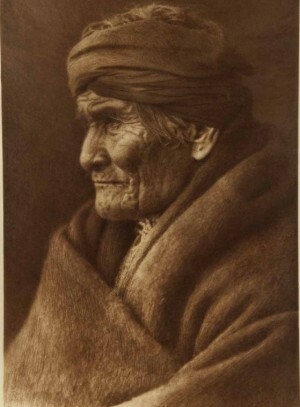 Below: "Geronimo–Apache, age seventy-six, taken at Carlisle, Pennsylvania, the day before he participated in President Roosevelt’s inauguration, 1905, Edward S. Curtis. RC 28(1):2, Heard Museum."